NOW. Well, actually, I think we all have a bit of the latter in us and that deep down inside when we are attempting to start a business online, we want to make money online fast. There is a different reality though. If you legitimately want to create a business online, it will take hard work, it will take persistence and it will take TIME (some would say it is slow). There are many programs out there that make some pretty bold guarantees. Make $1,000’s within your first couple of weeks. Make $$$ in 30 days or I will pay you all of your money back. Blah, blah, blah. These programs attract those types that are “hopeful” of their success, those that want to earn money and the idea of doing it really fast gets them excited. The problem is that in order to EARN MONEY SUPER DUPER FAST, you are either going to have to scam someone else into that very same idea by getting them to buy something off of you or you are going to have to sell people into a scheme. You see this just about everywhere these days. People that boast MILLION DOLLAR DAYS or that sport a video of them riding around in their Ferrari, their big stacks of money in hand, and their fancy (and often times rented mansions). These are the marketers that I categorize as the “outrageous” claims marketers. They sell people on the idea of massive success, and RARELY will tell you what they are even selling….other than you need to buy their wares to achieve the same level of success as them. They make the greasiest used car salesman look like an angel. I know it sounds bad, and it is. 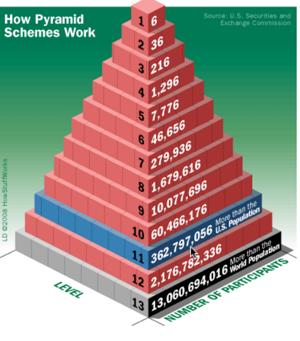 There are many ponzi and pyramid schemes out there these days in the MLM world and even some that claim they are “affiliate marketing” companies, but plain and simple they are just putting up the blinders and a big facade hiding what they are, A PYRAMID. These are signs that you are choosing a technique that will lead you to “robbing” from your neighbour to build an income online. Yes, you can make money fast when you sell people on the idea of hope and sell them on “overpriced” programs, but your success will be short-lived as you will run out of people that you can rip off. Many so called “MLM’s” are trying to present themselves in a way that they are legitimate, but the reality is that in order to recoup your money that you have spent on the program, you are required to get others to invest in it (the same way that you have). These sorts of programs come and go and one of the most recent ones that I wrote about was Banners Broker, which was ultimately shut down and the founders of this program were both arrested and are currently serving jail time. These sorts of programs are constantly popping up online and they tend to claim “massive opportunity” or “massive commissions” without really telling you what you will be doing (until you have invested into the program already). Be careful. These programs are illegal in most parts of the world and once they gain traction, they are usually taken out by the FTC/SEC or legal authorities. Plain old spamming. Email spam. Comment spam. Spamming social media. Spamming you through the phone. Spamming you through the mail. These are effective, unsolicited ways that people are constantly doing to scam people out of their money. There are many of these taking place online, in particular within the domain, SEO and coaching spaces. If you buy a domain (your own .com domain for example) and you leave your private details open, you are almost guaranteed to get at least one phone call, email and mail spam promoting a variety of products and services to you, many of which are very deceitful. I recently voiced my concerns about this form of solicitation with a domain scam that is going around. People that are new to something are the most vulnerable. If you told me that I could jump 3 feet higher if I wore these special shoes that make you stand on your tippy toes, then I probably wouldn’t believe you. I have spent years playing basketball and I have a good deal of experience when it comes to “vertical leap” training. But if I was just getting started and I wanted to try to gain an upper hand by being able to jump higher, I would probably spend my $300-400 on these special shoes (only to be disappointed). The problem when a newbie gets ripped off is that they feel like they were the dumb one. “How could I have fallen for this?”. It is quite embarrassing and within the make money and opportunity world, people often times just go on their way instead of actually reporting scams/schemes to the FTC or otherwise. OK, enough of the bad news. There is good news that can come of all of this and that is some REAL, ethical ways in which you can build a business online. There are truly are very legitimate and ethical ways to make money online. Chances are if you have been involved in the “opportunity” world for any amount of time, you have likely been in contact with one or more of the “make money fast” scams I have mentioned above. There is hope though and I am going to walk you through the process of building a “business” online. Making money online faster than in conventional offline businesses is a reality. In fact, the time in which it takes to create a business online is minimal compare to an offline world and the costs of starting a business are less than a few hundred dollars. Yes, you read that correctly. You don’t need to spend $1,000’s on education, tools, websites, hosting, lead generators, traffic, etc to create, grow and manage a very successful business online. To give you a few directions, I am going to give you 5 of the best ways in which you can make money online. People always ask me, what is the starting point of a business online. The answer: A NICHE. A niche is an audience or a group of people interested in something. This could be anything, from “how to train dog how to race”, to “football snack helmets” to “making money online”. There are literally millions of niches and the playing field is level for any one of us to enter to any niche within the online world and carve out a very successful business online. This is one of the fundamental business models that we teach at Wealthy Affiliate and it is a business that can take shape rather quickly (in a few months time). The cost of entry: Less than $100 and you don’t need any experience. Affiliate marketing is a business model that allow you to promote millions of products and services online without having to (a) purchase the products (b) house inventory (c) deal with any product support. It is a brilliant model and a very high percentage of every transaction online is affiliate marketing based. When you join an affiliate program, you are given special links that are unique to you. Your goal as an affiliate marketer is then to drive sales to this company through your link. If you do, they will split the revenue for you on a commissioned basis, ranging anywhere from 1% to 75% depending on the affiliate program. There are no costs to joining legitimate affiliate programs. The Affiliate Marketing model for making money online works really well in combination with niche websites. On your niche websites you can take advantage of as many affiliate programs as you like and build out a business a potentially VAST revenue stream in the process. There are several platforms out there that allow you to create and sell digital products. These range from platforms like Clickbank where you can sell your own ebooks and how to guides, to the likes of Amazon where you can sell your own ebooks through the Kindle network. As many niches as there are (millions) there are as many opportunities selling digital products within those spaces. The beautiful thing about selling anything “digital” is that you create it once and there are no additional costs for delivering the product or service after the initial expenses of creation. You could sell the same ebook or the same digital course a million times and the delivery of this won’t cost you anything (that is, it is all profit). The cost of entry: Less than $150 and you don’t need any experience. Lots of people are hoarders, have product inventory, or are into drop shipping. Mediums like eBay can facilitate this type of business and you can sell anything you like on eBay. So if you have household items that you would like to sell and make money from or you have access to inventory of a particular product, then eBay can be a viable option of making money online. If you are selling a TV or some old clothing on eBay, obviously you are not building an actual business (rather just “spot” income), so if you are going to create a business within the eBay space you will need inventory of products to sell in scale. The only problem with this business model is that your success is tied directly to how much time you have. You only have so much time in a day to apply to your freelancing gigs, therefore once your time has been maxed out, your earning potential does. There are many platforms out there in which you can offer your services, whether you are computer programmer, a writer/author, graphic designer, SEO expert, or otherwise. There are 1,000’s of potential tasks/jobs that can make money online through freelancing gigs. This is a good way to make money online, but you are in essence a hired “worker” or “contractor”, rather than being a business owner. A big difference, but it is indisputable that you can earn a good living doing so. The cost of entry: Free, fees taken by freelancing sites based on completed gigs. There you have it, a walk through of making money “fast” within the online world versus making money a bit slower (and more ethically). There are many directions you can head within the online world, lots of products popping up claiming to be the next best thing (and often times nothing more than another shiny object), and lots of companies that are in the business of making money, not actually helping you out. If a product claims that it will make you money overnight, question it. It is likely going to encourage you to do something that might be outside of your realm and ethics. If you want to create a proper business, there is a proper path to doing so and I will be more than happy to help you out if you ever want to create an ethical, fun, long term business. If you have any questions about making money online or experiences to share, I would love to hear your feedback below. I’ve always liked the idea of growing my own niche site because it means I get to work for myself and I don’t have to worry about losing work. I’m in no hurry to grow a business, because I understand it takes time and hard work, but I’m really excited to have found WA because it’s breaking everything down into chunks I can digest so I’m not overwhelmed. This is a great reminder or reality check for those tempted to fall for the scams that make empty promises just to get your money. Absolutely. There is a natural tendency to want to make money, and make it now. It is the lottery mentality and I think we all have a bit of that in us. However, when it comes to the online business and the affiliate marketing world, it is critical that people give themselves adequate time to achieve results. The time and energy you invest in your business now doesn’t pay off immediately (like an hourly job), it pays dividends down the road and often times forever. I found this article very informative, and As I read through I am interested in learning more about Creating Digital Products and how to leverage that? I would be very grateful if you can Help me understand more about Creating Digital Products. I love the 5 Ways to be successful online, opened my eyes. Thank you. There are many ways in which you can create digital products, but before you do I would recommend that you consider WHO your audience is and that you actually build a brand and a following before you attempt to create a digital product. At the core of every successful digital product is a means to get traffic, a way to build yourself as a trusted authority (nobody is going to buy your book, your membership, your product without trust) and an understanding as to how to market to people within your given niche/industry. So these should be the first focuses with your business and we can help you learn all about this at Wealthy Affiliate. Kyle, this is excellent content. And I must say ‘about time’ that someone with actual, organic success writes about how it it possible to succeed online while being totally ethical. So many don’t realize that or think it’s not possible. I’ve been working on a similar article, and you’ve given me some great food for thought and I just might be linking to this post, if you don’t mind. It is quite problematic that the “norm” in the industry has become promoting instant success, just to sell your product/service. This is not the reality of creating a business online, it takes time and it takes hard work. But those selling the koolaid are very convincing and often times the moment they have your money, they are running for the hills. And feel free to share this, I have no problems with that Steve. Kyle- The more I read your writings the respect I gain for you. I know we’re not supposed to talk politics but I just want to make a connection for you and your readers. You said, “It is quite problematic that the “norm” in the industry has become promoting instant success, just to sell your product/service.” In a very real way, that’s how we got our President-Elect, Donald J. Trump. And it goes deeper when you look at the overall acceptance of lying in our society today. The word is that Canada won’t even let Fox news on their air waves because of the shoddy reporting and,at times, outright lies being told there. OK. I just had to get that off my chest. I hope it isn’t too borderline. Thanks again for what you do. Lying online has become OK and acceptable. It is almost as if you are not hiding upsells, downsells or the actual costs of a program, then you don’t fit in with what is going on in the industry. There are many products that are less than $50, some even $1 to join where you end up getting inside of them only to realize that if you truly want to benefit from the program there are upwards of $50,000-$100,000 in fees. This is not OK and this is what these so called “businesses” are doing with trusting customers, thus adversely impacting the reputation of the online business world as a whole. I hope that this article alone can bring some sense to people. You shouldn’t be spending $1,000’s to start a business online, if you are, you are more than likely overpaying or worse yet, being scammed. After 12 years as a software tester I found myself to be a stay-at-home mom. This was never the plan, I had worked hard in those 12 years to achieve success, but due to a change in circumstance I had no alternative but to give up on my career. For a few months I enjoyed the time at home but eventually I grew restless, I needed to be doing something of substance and I wanted the ability to earn an income. I started looking around for something to do from home (online) and at my own time. Fortunately, I never fell for a scam but unfortunately I also didnâ€™t find what I was looking for. Selling beauty products from home wasnâ€™t an option (for me) and neither was online freelancing. With freelancing I found that the competition from lower income countries generally brought down the remuneration rates too much. Eventually I settled on looking for a data capturing job that I could do from home. My word, if ever you want to see a scam do a search for â€œwork-from-home-data-capturing- jobsâ€. I had previously heard of affiliate marketing and thought this would be my next pursuit. Unfortunately, I didnâ€™t know what tools, such as WordPress, were at my disposal. I went off the deep-end and started learning PHP (programming). I was going to create my own website and figure out the marketing bit later. I soon realized it would take forever before I knew enough about programming to actually get a web site up and running! At the point of giving up on my web site I came upon Wealthy Affiliate. They offered all the tools I needed to do what I had wanted to do, but didnâ€™t know how to do. I was immediately impressed by their training videos and was able to recognize the value and quality of their product. At no stage did I get the impression that it was a scam. They made it clear that my success would depend on how hard I was willing to work. I liked the idea of choosing a niche, something that was of interest to me, being my own boss, working my own hours and making my own money. I have so much faith in the program that I have taken out a premium membership with Wealthy Affiliate. I have my first website up and running and I am in the process of getting the traffic going. Once I have traffic I am confident that I will have an income. The Wealthy Affiliate model makes 100% sense and I can absolutely see it working. Your story sounds so familiar to many others that have worked with over the years. It is easy to be pulled in so many directions as there truly is so many programs out there claiming that they can teach you to make money fast through their latest and greatest technique. The problem is this. 99% of them don’t work in the way they say they do or they can only work if you already have a business or a huge mailing list in place, thus deeming them as very deceptive (and that is the only reason they sell well). Many of these programs are also sold on “ideologies” and “theories” that are untested and work well when shown on paper, but for all practical purposes the techniques don’t work in the real life. It happens to the best of us. INSTANT anything is alluring. The lottery system wouldn’t be so popular if there wasn’t people that wanted to strike it rich, without having to do anything for it other than outlay a fraction of the overall pot. The same goes with the online world and the problem is that this attitude and ideology is exaggerated by those companies pushing products/services on the premise that they will make you money overnight, make money quick, and do so without much effort. The reality is that these don’t exist and the ones where you do make money quick, you are in essence having to steal from the next person that joins into the scheme. 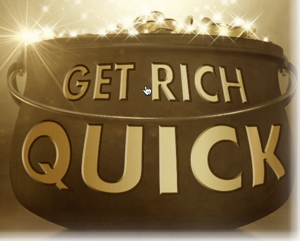 With so many get rich quick guru’s, you are hard press to locate a credible community. I’ve been in and out of internet marketing over the years and up until I found WA, I was at dead ends. Most online marketing communities just simply up sell you on more and more product without the support. I can honesty say that WA is the most supportive forum I’ve encountered in my years of trying to build an online business. I thank want to thank you for this great article. This information you composed should be share on all social media networks. Thanks for your kind words and yes, I concur. There are a huge number of “gurus” out there that are in the business of taking your money, not offering a quality and fairly valued service in exchange for your money. One thing that we learned early on in business and principles we have stuck with for the last 11 years is that in order to build a successful business online in any niche, you must focus on helping people not making money off of people. They way you perceive the path to success can really dictate whether or not it actually happens and whether or not it is done in an ethical way. I know I should be more patient but I really wish I could make money online fast. It seems that many people think of the internet as a magic ATM machine. If we just knew the secret we could make money come out of it. Sadly, that’s not the case. I made money for years as a freelancer and eventually burned out. As you mentioned, a freelancer is trading time for dollars. That’s why I was determined to find a way to use the power of the internet to make money. Fortunately, I found Wealthy Affiliate and learned to treat my online efforts as a business. It took four months before I earned my first dollar. I almost gave up and I’m so glad I didn’t. It’s been 18 months now and every month I earn more than the previous month. Kyle, just between you and me, if there was a secret way to make money fast, you’d tell me wouldn’t you? Yeah, they do view it as a magic ATM machine. The reality is this. If you want to create a business, offline or online, it is going to take some work. Fortunately though, within the online world the costs and startup is next to nothing compared to the offline world and you have the freedom to create and grow your business from anywhere that you have access to the Internet (which is truly a beautiful thing). Those that want to make money fast will probably want to continue buying lottery tickets. The alternative is ripping people off, which can come with some serious repercussions (as many of these types of companies online are getting shut down and in some cases, those involved/operating it are going to jail). And yeah, if there was a secret to overnight success I would tell you. It wouldn’t be nearly as gratifying as building an actual business, but I would let you know! In a recent episode of Whiteboard Friday, Rand was discussing methods for designing a blog that can rank in the search engines. He ended his speech with the comment that the blogging process typically is repeated up to 70 or more times before there is any real success. Even hundreds of times before you should expect a high hit rate. So many bloggers that I know were not prepared to put in that level of effort. It takes time, lots of it. I definitely wouldn’t say it takes 70 blog posts to see results or reach success, but the more content you create and the higher the quality content, the more authority you are going to naturally attract within Google and other search engines. I tend to see the breakthrough for a given website around the 3 month mark (this goes for pretty much any business). You will start to see more and more results as you continue to build out content, help people, gain expertise in your respective niche, and get engagement and dialogue within your content. Through time the REVENUE just becomes a natural byproduct of what you have created. Rand and the guys over at Moz are good dudes and they share the same principles and vision we do. Creating brands and authority within a given niche. I did some research on Fiverr and assuming that your gig sell for $5, you are only taking home about $3.58 after sharing some of your earnings with Fiverr and PayPal (about 20% cut). That’s something to consider from a seller’s perspective, how much are you willing to work to earn $3.5 for every single gig. Also, there’s a growing population of scammers ‘for hire’ within Fiverr itself – making fake video testimonials, sending high traffic to website for $5 and etc. The fact that Fiverr allows this type of listing to be published and earn commission from it, makes me question their business legitimacy as well. Doing “gigs” is definitely working with the employee model, your hard work and efforts are being bought by someone else who is taking advantage of them to earn more money. In the case of content, they are likely using that content to get further rankings in search engines and subsequently more traffic. I would recommend using platforms like fiverr.com to get “seed money” for your campaigns, but I wouldn’t recommend that you try to make a business out of it. You can earn much more money by utilizing your own writing efforts to build out your own websites and scale your business that way. I agree with that Cathy. That is something I point out on my website when I review some of the binary options scams. They seem to employ fiverr actors to sell their scams! This article is what brought myself to WA to begin with. I have spent years selling online via eBay and overstock and at times it is highly profitable when buying and selling collectables but I have hit a road block now that things have kind of dried up in my area. Drop shippers there is very little profit margin and I have found not worth my while the amount of work I put into listing. keeping up with fee’s and other issues. Why I am pursuing internet marketing thru Wealthy Affiliate. There are many ways in which one can make money online, some are better than others but the unfortunate thing is the fact that some are deemed “ethical” when in fact they are not. Also, some ideas and strategies are sold in “theory”, one of these being the massive profits that people claim within the dropshipping space. There are very few people that I have ever met that have earned decent money through drop shipping, albeit it viable, the competition is rife and the overhead and the time in which you need to run your operating compared to affiliate marketing is much more (with less return). Most of the profits in dropshipping these days are those doing arbitrage (selling on eBay, shipping from their Amazon account). Your post is correct. There are a lot “opportunities” out there putting out very unrealistic numbers with regard to how fast money can be made. Even some of those who eventually make it work have seen a sudden halt to their income when the company shuts down. It is better to have your own business. That happens more often than people think. They get involved within a “scheme”, the invest an incredible amount of time and money into the given scheme and they shut their doors either because people stop joining (which means they don’t have the funds to continue) or they get down by the FTC, SEC or legal authorities. This has happened more times than I can count in the last few years and it is my belief that there are many companies right that are either being investigated or on the verge of being investigated for how their scheme operates. At the end of the day, before you decide to choose a path to make money online (because there are many), you have to ask yourself what are you going to be doing, are you doing something that is ethical or is it something that could get shut down, and is the premise of your venture making money or is it helping people. If you can answer these questions and the business direction you have chosen doesn’t reside on activities that are unethical or activities that have the sole focus on MONEY and nothing else, you should reconsider. I enjoyed reading this article. I have tried on and off with different programs. Each one only wanted me to buy buy buy and not offer much help. I am so glad I came across wealthy affiliate. I think I can finally really learn how to do this. I am glad I won’t be falling for any more scams. Yeah, far too me programs implement this tactic. They get you in the doors, turn you into a customer at a low ticket price and then usually strap you with many purchases, often times in the $1,000’s. Good to hear you have smartened to this concept and this tactic used by others and I can now assure you that you are in a safe have now that you have found WA! I love how you explain how one must work towards success Kyle, in comparison to “I want it now” concept. It is realistic and I believe it really gives the customer the opportunity to make an educated decision on how to build a business in a way where you are making money, but doing so in a way that has more vision. I hope to have a website one day that follows these exact principles. Unfortunately as more and more products out there show people they can making $10,000 overnight or be driving a ferrari in a week, the more that people will desire instant success. This is the lottery mentality that is being evoked by this radical spineless sales pitches taking place in the industry and it is unfortunate that the way people approach success is changing as a result. To build a business and to make money in business, one must approach it LIKE a business. Yes I believe hard work and honesty is the proper direction to success. At the end of the day you want to feel good about what you accomplished. You tend to sleep a little better knowing that it was honest and legit.